Marlene Monteiro Freitas took international stages and audiences by storm with her expressive and vital dance pieces – previously in Frankfurt with „Of Ivory and Flesh“. 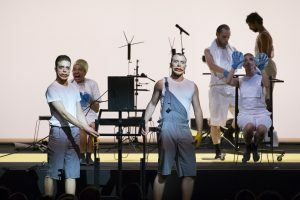 For her new piece, she assembles eight dancers and five trumpeters for an off-the-wall update of Euripides’ tragedy “The Bacchae”. She uses his theme of a battle between order and reason on one side and irrationality and intoxication on the other to develop an existential trip of high visuality that is inspired both by the carnival in her hometown on Cape Verde and by mythological motifs and pop culture. In a contemporary parade of complex figures, she grotesquely elevates scenes from everyday life to create disturbing musical states of ecstasy. „Bacantes“ thus develops an emotional density that some would call cathartic and that may move us alternately to outburts of laughter and pensive stillness. MARLENE MONTEIRO FREITAS (Cape Verde, 1979) studied dance at P.A.R.T.S. in Brussels, in Lisbon at the Escola Superior de Dança and at the Fundação Calouste Gulbenkian. In her native country, Cape Verde, she co-founded the dance group Compass and collaborates with musician Vasco Martins. She worked with Emmanuelle Huynh, Loïc Touzé, Tânia Carvalho, Boris Charmatz, among others. Her creations include: Bacchae – Prelude to a Purge (2017), Jaguar (2015), with Andreas Merk, Of ivory and flesh – statues also suffer (2014), Paradise – private collection (2012-13), (M)imosa, co-created with Trajal Harrell, François Chaignaud and Cecilia Bengolea (2011), Guintche (2010), A Seriedade do Animal (2009-10), Uns e Outros (2008), A Improbabilidade da Certeza (2006), Larvar (2006), Primeira Impressão (2005). The common denominator of these works is openness, impurity and intensity. In 2017 Portuguese Society of Authors (SPA), awarded Jaguar, the prize for the best choreography and in the same year she was distinguished by the government of Cape Verde for her cultural achievement. 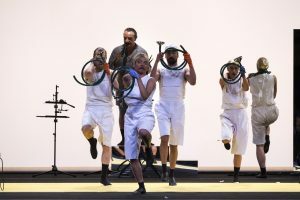 In 2018 created the piece Canine Jaunâtre 3 for Batsheva Dance Company. Still in 2018 La Biennale di Venezia has awarded MMF with the Silver Lion for Dance. She has an ongoing collaboration with O Espaço do Tempo (PT). She is the co-founder of P.OR.K, her production structure in Lisbon (PT).